Dentures are a removable set of teeth. Dental implant dentures combine today's technology with older traditions to create a realistic set of teeth capable of remaining safely and securely within the mouth. Gone is the fear of the falsies falling out of your mouth at an inappropriate time. The use of dental implants has improved the stability of the once insecure appliance. Dentures remain an option to replace a series of lost teeth. Implant dentures are an improved way of accomplishing the same thing. Whether it is for a partial or complete denture, the combination of implant and denture increase the flexibility of use and care. Implants grant a sense of permanence. Dentures, by their very nature, are removable. The result of the blending of the two forms of tooth technology creates a special denture. It is one with a solid fit but with easy removal for maintenance – although some implant dentures are permanent. The technology ensures this. Yet, what exactly is an implant denture or overdenture? What Is An Implant Denture or Overdenture? The process involves placing the implants and abutments into the bones of the teeth. 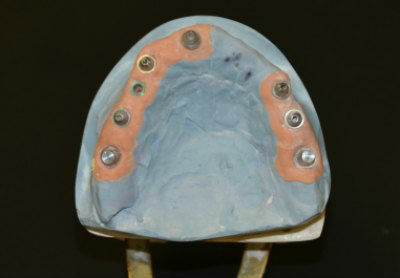 If the denture is to be removable, the denture is clamped to a metal bar or a round ball anchor atop the implants. If the structure is permanent, the dentist screws or cements the denture to the abutment of the implant. Yet, it is not always feasible to put into place an implant denture. Beside the overall cost of implants added to the price of dentures, certain cases are better suited. If all teeth are missing from your mouth, an implant may prove to be the answer. It can act to support a full denture or a full bridge. While the dental implant procedure requires surgery, the process is quick and relatively painless. As in the case with traditional implants, dental implant problems or potential dental implant failure offer little about which to worry. 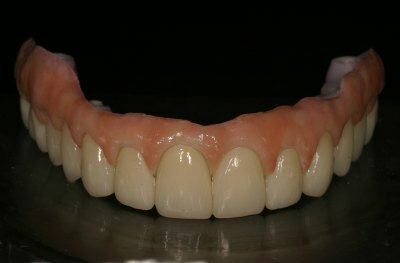 The advantages of implant dentures revolve around the fit. While dentures rely on saliva and/or other material for adherence, implant dentures do not. These rest on the metal posts firmly affixed in the mouth. This ensures a better fit and a secure one. The naturalness of the overall look is an extra benefit. 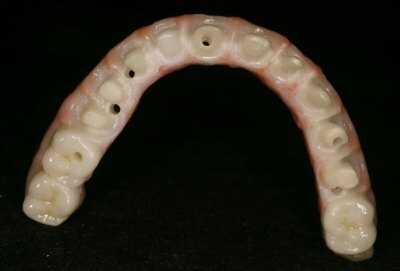 Longevity of this type of dentures is also an advantage. The bridges are constructed for long lasting durability. 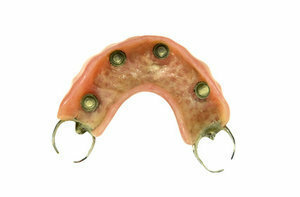 In addition, comfort and stability are benefits often lacking in stand-alone dentures. Being able to chew food naturally without worry is one positive aspect. Realizing the implants are helping to preserve the jawbone is another. This does not say anything about the overall esthetics. Overtime, dentures may result in a fading jaw line and a depressed smile. Combining dentures with implants will reduce this. The smile will remain longer and stay brighter. It is possible to decrease in general the dental implant dentures cost by using the less expensive "mini" dental implants. This may not result in cheap dental implants, but it may make the process less expensive. Affordable dental implants combined with dentures are possible. Overdentures or dental implant dentures offer one of the best ways to restore lost or missing teeth. Security, as well as the ability to eat with self-assurance and natural zest, is a significant characteristic of implant dentures. Add to this the ability to smile with complete confidence and there is no wonder why some people prefer implant dentures to the traditional form.